Hide ALL IP claims to hide your IP address, avoid WebRTC leaks, torrent safely and negate IP bans. It uses HTTP tunneling protocol instead of OpenVPN which is more common, and perhaps, more secure. You can order their VPN for $29 annually. Furthermore, Hide ALL IP is operated by Network & Speed Inc, which launched it’s VPN service in 2014. They’re located in Hing Kong jurisdiction and as of July 2019, they have 150+ servers spread out across 38 countries. Find out if it’s really a worth using VPN app. Hide ALL IP looks like this on Windows OP. Hide ALL IP provides a rock-solid connection, works with Netflix, and allows unlimited torrenting. Leaks undermine a lot of VPNs. 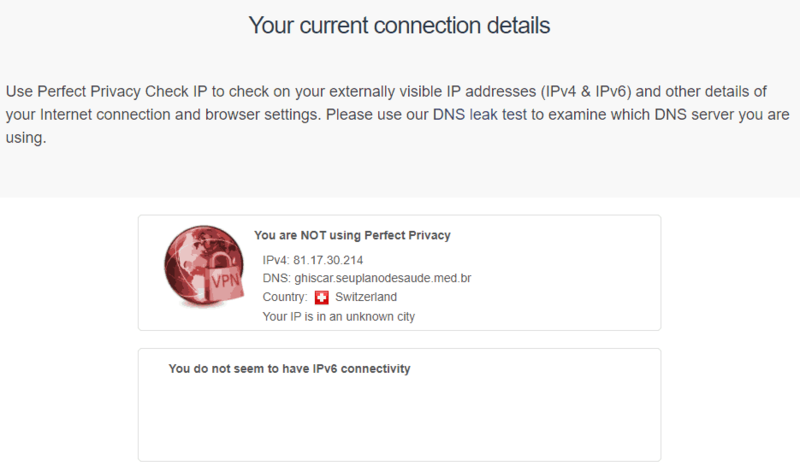 If your ISP is able to detect your activity, the VPN serves no purpose. This might be a no-brainer concept to most, but we’ve found that 8 out of 17 VPNs can leak your information through chrome extensions alone. Two of the most common leaks that lead to failure are WebRTC leaks and DNS leaks. DNS (or domain name system) controls a domain’s website and email settings. When you go to a website, the DNS controls which server you reach out to. A DNS Leak occurs when your system sends an unencrypted query which leaks out of the VPN tunnel. That means your ISP (and virtually everyone else) can see which sites you’re visiting. WebRTC is an open project used by a number of web browsers that will leak your IP address, even if you’re using a VPN. It does this by providing Real-Time-Communications (the “RTC” part) to the browser. Every VPN we review gets put to the test six different times to make sure none of your data will accidentally leak out. 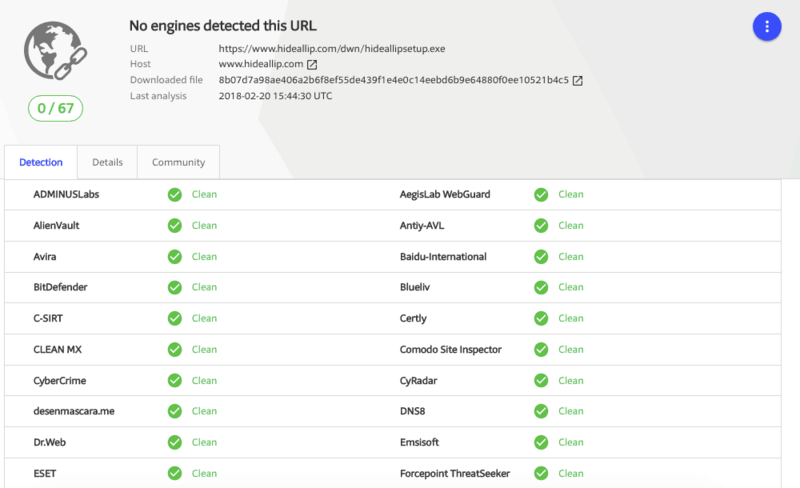 We put Hide ALL IP through the ringer, and I’m happy to report that it is one safe program. But that’s not the only thing we look for. We also double-check the legitimacy of VPNs installation files to make sure there’s no malware hiding in plain sight. Once again, Hide ALL IP comes out clean. So, when it comes to leaks, Hide ALL IP is airtight. In fact, the world’s most popular streaming service has gone out of its way to implement one of the most sophisticated VPN detection systems in the world. Netflix and other popular streaming sites like Hulu are bound by licensing restrictions. That’s why someone in Canada does not have the same content as those in the United States. The answer was once simple. A Canadian craving American Netflix content logged onto their VPN, selected a server in the US, and it worked. We ran Netflix through five different servers on Hide ALL IP. Three out of five of those servers worked perfectly. Hide ALL IP is pretty careful to not mention Netflix by name on their official site, however. They talk about Hulu, the BBC, and iPlayer, but not Netflix. So, while some servers worked with Netflix, it’s not a service the company is necessarily touting. Torrenting allows you to download huge files at fast speeds. But that often comes at a cost. You’re also left completely exposed to other users on the same network. Using a VPN for torrenting gives you an extra layer of security, locking-down your connection from others. 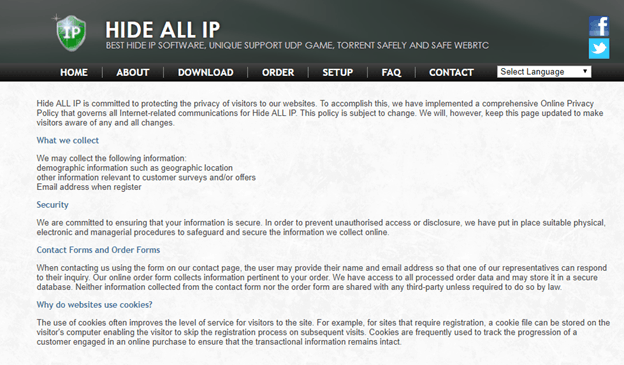 Hide ALL IP confirms that they offer to torrent on all 150+ servers, with no restrictions. They do recommend the use of two programs, uTorrent and BitTorrent, for maximum performance. What’s more, there is no premium package or an additional charge to torrent. Hooray! Hide ALL IP provides a lot to like. Their logging policy is pretty bare bones (in a good way). They came out clean in all of our leak tests. And they were also friendly to both Netflix and Torrent users. There were a few issues we ran into while reviewing the service, though. Here are some of the biggest warts we found. Hide ALL IP claims that it does not log any of your information on their frequently asked questions. There you have it. “No any logs kept.” That’s enough to win your trust, right? Well, you should have trust issues online. Every VPN company claims that they don’t log your information. To get the real story, it’s best to dive into the convoluted world of privacy policies. These are long, drawn-out strings of information that can be tiresome to sift through. So don’t skimp on the coffee (or something stronger). Well… that’s actually pretty brief. Unusually so. Not a lot of information is shared here, which instantly makes me worried. But what I really want to see are the specifics of their data collection efforts. “Other information relevant to customer surveys and/or offers.” That’s the sentence that gives me pause. What kind of information? The websites you visit? Your birthday? Are they selling my information to third parties? This isn’t telling you nearly enough. So, while the official company line states that they don’t log information, I don’t really have enough confidence in that statement to believe it. 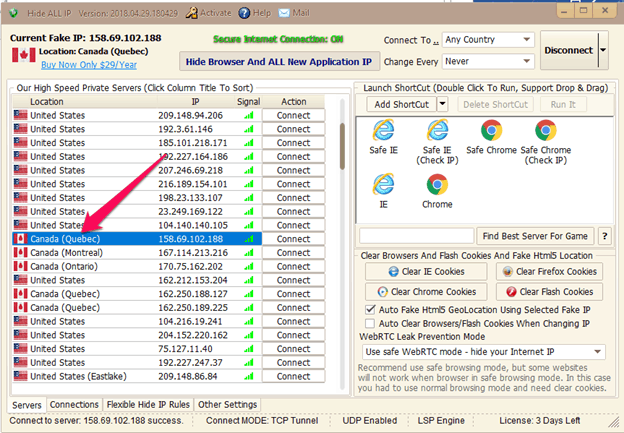 Hide ALL IP is owned by Network & Speed Inc., which is run out of the Hong Kong. This is a good thing on the surface! Hong Kong isn’t involved in the 5 Eyes international surveillance alliance. This is the information sharing agreement between the United Kingdom, Canada, New Zealand, Australia, and the United States. Since its creation, membership has expanded up to 14 developed nations around the free world. That means the U.S. can and will give your information to its allied nations, if need be. They’re still bound by Chinese laws. And China has strict VPN laws. So you won’t have to worry about multiple countries getting their hands on your data. However, you will have to still worry about an authoritarian regime that can do pretty much whatever it wants, whenever it wants. It’s maybe a little better. But not by much. One of the main reasons people look for a VPN is because they want to stream geo-blocked content. But that requires decent internet speeds. Which is one area where Hide ALL IP fails dramatically. After scanning for leaks, we put Hide ALL IP through a series of speed tests. We expected there to be a decrease. All VPNs will slow you down a bit. How much depends on a number of factors including distance to the server, the internet speed provided by your ISP, the quality of your encryption, and the current server load. However, the results we found were a bit excessive. We started out with download speeds of 97 Mbps and upload speeds of 53 Mbps. We connected to Hide ALL IP and tested two servers, one in the EU, and one in the US. Unfortunately, the first EU test was a sign of bad things to come. Our U.S. speed test was the very definition of awful. Speeds reached such a low point that I was left scratching my head. When you consider that Netflix recommends a download speed of 5 Mbps for HD content, the EU server only just makes the cut and the US server fails by almost 50%. Hide ALL IP addressed the issue on their website. Kinda. Sorta. If you can decipher what it means. Overall, out of 78 VPNs, we rank the speed of Hide ALL IP at 73. It’s no wonder it’s not the fastest VPN we’ve reviewed. Hide ALL IP uses HTTP tunneling protocols (as opposed to OpenVPN) to create a direct network link between two locations. It’s fine. A weakness of this system, however, lies in not being able to switch protocols. OpenVPN is widely considered to be the industry standard, but Hide ALL IP doesn’t support it. Or any others for that matter. Hide ALL IP also uses “industry-standard RSA 2048 and AES/DES encryption.” That’s government-level encryption, so it’s very safe. But it’s not quite as strong as the AES-256 key that other top VPNs use. Is it safe? Absolutely. Can it be better? Yes. Hide ALL IP only works on computers, and has no mobile or smart device functionality. That means it also doesn’t work with gaming systems, Smart TVs, routers, or Linux. The only silver lining is that you can use Hide ALL IP on a few web browsers. Hide ALL IP does include a kill switch, which will disconnect if your VPN becomes unstable. This is an extra layer of security to make sure that your IP address doesn’t accidentally pop up on someone’s radar. All top VPNs should include a kill switch, especially those being used by businesses who are protecting their employees’ information while they work remotely. Overall, installation and connection was fairly easy. If you grew up in the Dial-Up era. Otherwise, the app itself looks extremely dated. And not in a retro-chic way that hipsters love. To their credit, switching from server to server wasn’t difficult. (Except, only countries and not individual locations were shown,) There’s an option to find the best server for a specific game that you want to play, and you can set a timer which will automatically change servers at set intervals. But when I first tried connection, the system crashed. And my browser froze. To make the app work with Chrome, I had to close Chrome and open it again through their software. I know, weird. The only other major issue I had was the poorly translated English instructions. It was cumbersome to read through the dashboard. Most VPNs give you anywhere from three to five simultaneous device connections right out of the gate. Connect to a router and that number jumps to an infinite number. Unfortunately, as we’ve already seen, Hide All IP doesn’t work with a router. Their one and only plan comes with one connection. There is no upgrade available. If you want this service on three computers, you’re paying for it three times. That would be an immediate no-go for a lot of users, however, Hide ALL IP does have portable functionality, and can be run from plug-in devices like a USB flash drive. Hide ALL IP has access to 150+ servers from 38 different countries. While not the largest server park we’ve seen, it’s not terrible. I was underwhelmed by the lack of customer support options. There is no live chat, no support ticket system, just a very standard contact form. 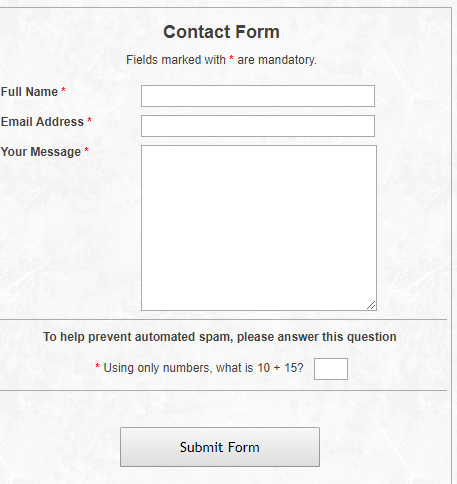 As you can see, the form has no categories to choose from, and only asks for your name, email, and question. I submitted a query about internet speeds. I received an answer an hour and a half later, which was impressive! I was less impressed with the response. I went into this knowing darn well that it was going to bludgeon my speeds to death in excess of over 90%. What I was looking for was transparency, and an explanation as to why, despite the speed loss, I would still find value in their service. Yes, that’s all that was required to answer my question. Technically speaking. But I was really hoping to see them go above and beyond the bare minimum. When your customer service is limited to a simple contact form, you hope that the help you receive will be something substantial that gives you confidence in their service. Hide ALL IP costs $29 for one year. Broken down, that’s a little more than $2.40 per-month. This is the only package that they offer. As noted before, the $29 gets you one connection. They do offer volume discounts if you want to purchase more than one license, but they don’t state up front what those discounts look like. This is a decent price, especially considering the Netflix functionality and unlimited torrenting capabilities. But you receive only one connection, it doesn’t work on smart devices, and the speed loss is epic. So there is a “you get what you pay for” scenario at work. I’m a fan of the use of PayPal in addition to traditional credit card transactions. I was also happy to see them including Bitcoin. It’s always nice to anonymous payment methods supported by a software that’s supposed to make you anonymous. As you can see, it’s a fairly inclusive offer. The free three day trial and 30-day unconditional money back guarantee is generous. Do I Recommend Hide ALL IP? Yes, the price is good. I like the portable functionality, and I think this could be a handy tool if you’re mostly looking to torrent. But all around, compared to other VPNs out there, it’s a hard pass for me. The speed is a huge problem. Losing up to 98% of my speed isn’t something I’m ready to sign on for. The customer service and overall readability of their website was another huge red flag for me. Both make this VPN seem shady. Find 10 Best VPNs here.